Smart vehicles that can be connected to the internet are usually described as “smartphones with wheels”. Yet, an increasing number of vehicles do not need to switch hardware, much like a smartphone. A software upgrade can only be completed through a download from the cloud, resulting in improved performance or new features. 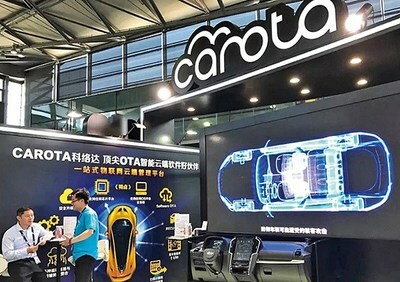 However, it is much more difficult to implement a full-vehicle OTA than a mobile phone, with Carota from Taiwan being one of the few companies on the market that are capable of providing automotive OTA services. Paul explained that the OTA function, which began with Tesla, has been clearly defined for smart automotive, saying, “It was actually Tesla who inspired us. By doing OTA well, vehicle owners can download their autopilot program “over the air”, as well as the engine control unit (ECU) for different cars in order to add new features, just like a mobile phone can download a new app.” Paul added that GMobi has provided many such services on mobile phones in the past and the experience can be extended to all kinds of smart devices, including cars. In addition to having different operating systems, different memory capacities and different in-car networks, each ECU will interact with each other. Compared to a smart vehicle, a smartphone is just like one of the components of a large system. “A vehicle upgrade is about a hundred times more complicated than a mobile phone upgrade,” Paul said. Smartphone vendors would only lose money if they failed to upgrade smartphones but people would die if carmakers failed to upgrade cars. In addition, as manager of Industrial Technology Research Institute’s Industrial Economics and Knowledge Center (IEK) Annie Shih said, the most important thing for OTA providers is that automakers would like to open the door to cooperation in support of subsequent data transfers. As a result, it is critical and also challenging for OTA providers to win the trust of automakers in addition to providing key technology capabilities. “We use security technology, which we are proud of, in combination with fast-response local services to serve car owners,” added Paul. “With extensive experience in the domestic market, we are well positioned to become a global company that all Chinese would take pride in by expanding into North America, Europe, Northeast Asia and emerging markets.” Based on its successful cooperation with several major carmakers, Carota is expected to easily gain recognition across the entire sector. Given the conformity effect that will emerge when an increasing number of vendors choose to collaborate with Carota, coupled with the difficulties in implementing OTA, automakers will likely rely on Carota once the partnership between them is established, bringing competitive advantages to the company. Given the increasing market demand for OTA but limited supply of the technology, Carota is preparing to take the opportunity to establish a presence in the world’s largest single automotive market as a pioneer in OTA technology. Paul said confidently that facing a future where everything is connected, Carota is already serving as the key gatekeeper in the automatic driving and 5G sectors. With an overwhelming advantage in complete vehicle OTA technology, Carota plans to support carmakers’ strategy for the next century throughout the full vehicle lifecycle from research and development to aftersale services, unlocking the unlimited potential of smart cars. Carota’s integrated one-stop OTA technology is the best partner for IoV and IoT when upgrading intelligent cloud software.